The Oklahoma Alliance for Animals takes a stand against animal neglect, abuse, and cruelty. We support law enforcement, help pay for necropsies conducted by the state lab, and silently attend court proceedings wearing red “No Excuse For Abuse” t-shirts to show support for prosecutors and the law. We invite you to join us. 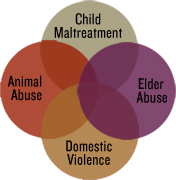 Animal cruelty is closed linked to domestic violence, child abuse and neglect, elder abuse, and other forms of violence (National Coalition). The National Link Coalition provides resource materials to fight animal cruelty, research and information regarding the connection between animal violence and other violent crimes, indicators of violence, videos and podcasts on the subject, and more. Oklahoma State Law requires food, water, shelter, and veterinary care to prevent suffering. Failure to provide is a felony violation. Additional laws are posted below. § 1685. Cruelty to animals Any person who shall willfully or maliciously torture, destroy or kill, or cruelly beat or injure, maim or mutilate any animal in subjugation or captivity, whether wild or tame, and whether belonging to the person or to another, or deprive any such animal of necessary food, drink, shelter, or veterinary care to prevent suffering; or who shall cause, procure or permit any such animal to be so tortured, destroyed or killed, or cruelly beaten or injured, maimed or mutilated, or deprived of necessary food, drink, shelter, or veterinary care to prevent suffering; or who shall willfully set on foot, instigate, engage in, or in any way further any act of cruelty to any animal, or any act tending to produce such cruelty, shall be guilty of a felony and shall be punished by imprisonment in the State Penitentiary not exceeding five (5) years, or by imprisonment in the county jail not exceeding one (1) year, or by a fine not exceeding Five Thousand Dollars ($5,000.00). Any animal so maltreated or abused shall be considered an abused or neglected animal. Flow-chart for responding to a cruelty complaint. For more information contact Ruth Steinberger. Purchase a red OAA “No Excuse for Animal Abuse” t-shirt for $20 (as shown above). T-shirts can be picked up at the OAA office in Tulsa or can be shipped for an additional cost. . Wear the red OAA “No Excuse for Animal Abuse” t-shirt to all animal cruelty court proceedings and participate as a silent member of the Red Shirt Brigade. Donate to OAA’s fund to fight animal cruelty. Participate in the annual Million Mutt March (details coming soon for fall 2016) to raise funds to fight animal cruelty. These funds are used to pay for legal necropsies to support animal cruelty prosection. The MMM is held every fall as part of Woofstock, the largest animal adoption event in Tulsa. Sign petitions asking the legal system to prosecute. View entire spreadsheet here including current cases, closed cases, resource pages, and animal cruelty arrests in Oklahoma. Be made the subject of an order issued to the owner by the appropriate court to provide care to the animal by the owner of the animal or by another person at a location approved by the court, with the order setting forth the conditions under which the animal will be housed and cared for, and given protection and a humane disposition. Obtain a court order to take custody of any animal found neglected or cruelly treated by removing the animal from its present location. 1. After an animal has been seized and prior to any charges being filed, the agency that took custody of the animal shall, within seven (7) days from the date of seizure, petition the district court in the county in which the animal was seized for a bond hearing to determine the cost and care for the animal. The bond hearing shall be held as soon as practicable and not more than ten (10) business days from the date of application for the bond hearing. If the court finds that probable cause exists that an animal has been abused, the court may order immediate forfeiture of the animal to the agency that took custody of the animal. Provided, however, within seventy-two (72) hours of the order of forfeiture, the person owning or having charge or custody of the animal may post a security bond in an amount determined by the court that is sufficient to reimburse all reasonable and anticipated costs incurred by the agency caring for the animal from the date of seizure. Reasonable costs include, but are not limited to, medical care and boarding of the animal. The bond shall be placed with the agency that took custody of the animal. The agency shall provide an accounting of expenses to the court when the animal is no longer in the custody of the agency or upon request by the court. The agency may petition the court for a subsequent bond hearing at any time. The bond hearing shall be held as soon as practicable and not more than ten (10) business days from the date of application for the bond hearing. When all expenses covered by the bond are exhausted and a subsequent bond has not been posted, the animal shall be forfeited to the agency. If the animal is returned to the person who previously owned or had charge or custody of the animal, funds not used for the care of the animal shall be returned. Nothing in this section shall prevent the euthanasia of a seized animal at any time as determined necessary by a licensed veterinarian of the state.